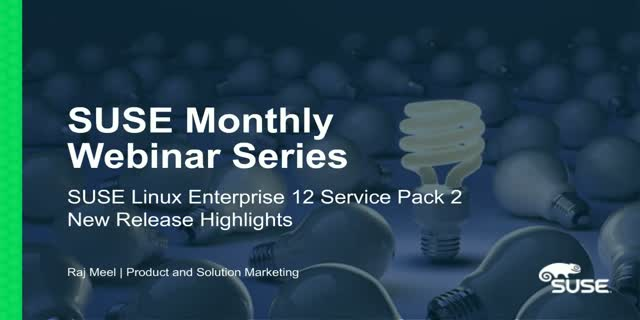 SUSE Linux Enterprise 12 SP2 – New Release Highlights! SUSE Linux Enterprise Server 12 is raising the bar in helping organizations to accelerate innovation, enhance system reliability, meet tough security requirements and adapt to new technologies. In this power packed session, learn about the latest SUSE Linux Enterprise 12 SP2 release showcased at SUSECON, Nov 7-11 2016 . Title: SUSE Linux Enterprise 12 SP2 – New Release Highlights!